Our professional aquarists design, fabricate, and install breathtaking custom aquariums in L.A. We combine art and science to create one-of-kind aquatic displays for commercial, residential, and entertainment production companies. Infinity Aquarium Design offers a full selection of freshwater and saltwater designs. Our complimentary on-site consultations determine individual fabrication, installation and structural requirements for every Los Angles aquarium design project we handle. Choose from a magnificent array of freshwater and saltwater fish, corals, and invertebrates to inhabit your customized aquatic environment. Check out more details below about the various aquarium designs, services, and maintenance we offer! Coral Reef Insert: An artificial replication of a tropical coral reef. This design is environmentally friendly and can support saltwater or freshwater fish. Decorative Coral Display: Humanely harvested, genuine Indo-Pacific coral pieces are constructed to resemble an authentic aquascape. This design’s synthetic habitat is extremely vibrant and colorful and can sustain saltwater and freshwater environments. Living Reef: A self-sustaining marine ecosystem of live corals, crustaceans, and invertebrates thriving in a shared habitat. This design is a living salt-water environment that cultivates natural ocean life interactions. Fresh Water Planted: An all-natural creation of tropical river and stream environments provides a glimpse into the freshwater ecosystems of the world. This design is an organic and tranquil underwater garden. Choose your preferred type of freshwater or saltwater aquarium. 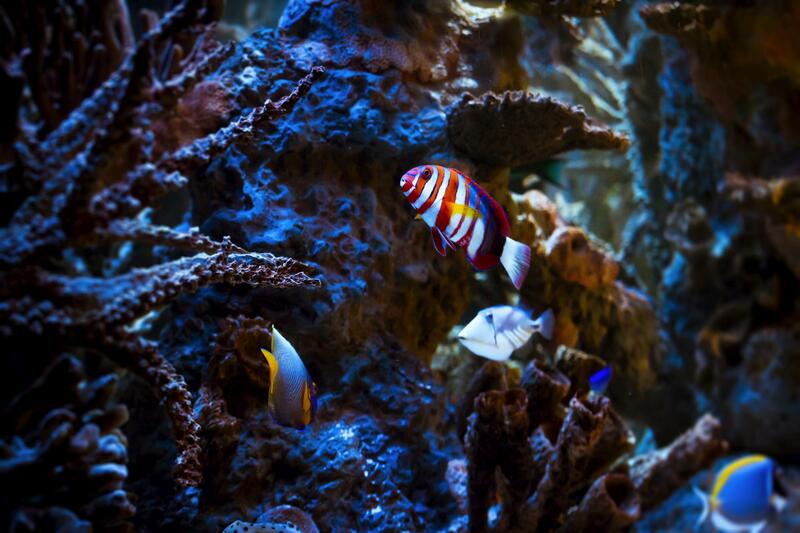 Your designer and contractor work with you to ensure the specific design requirements of the aquarium location are met. The system is custom-designed to accommodate the location’s plumbing, electrical, and structural elements. Utilizing the highest-quality acrylic and glass materials, we bend and mold the aquarium into your desired size and shape. Our team of professionals installs everything from in-wall to free standing aquariums. We perform commercial and residential project installations of all sizes. No matter the design specifications, our craftsmen will provide everything required to ensure complete satisfaction with your new aquarium. Infinity Aquarium Design has over 30 years of experience creating outstanding custom aquariums in Los Angeles. We can bring any aquatic vision to life—call us today at (800) 590-3474 or contact us online to start planning your project!